Wouldn’t it be cool if Delta knew whom you wanted to spend time with and helped reconnect you with the ones you miss? The Delta Reconnect app offers you options to find flight deals to visit your friends. With Delta Reconnect, we’re bringing together friends and loved ones in an organic and privacy considerate way. When you write something like “I miss you” on a friend’s Facebook wall, our app unobtrusively pushes you the best flight deal to visit your friend. 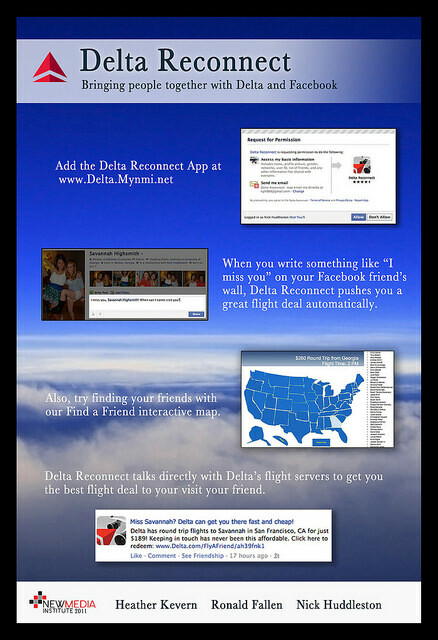 When you visit the Delta Reconnect Friend Finder app on Facebook, you can find flight deals to visit your friends by scanning over the states with your cursor. With this technology you can connect through your Facebook and find great flight deals to visit your friends without spending countless hours searching the internet. It knows who you care about and where to find them, and brings you together in a whole new way! Delta Reconnect is the hot new way to make travel plans!